Here's a link to the history of the Eurelec vacuum tube testers (in French, here's a Google translate version (2016-01-25)). According to this page, these testers were known as Euratele in Germany and Elettra in Italy. This explains the similarity to the Euratele unit shown on Jogi's page (in German, here's a Google translate version (2016-01-25) -- Thanks to Carsten Falck for the pointer). 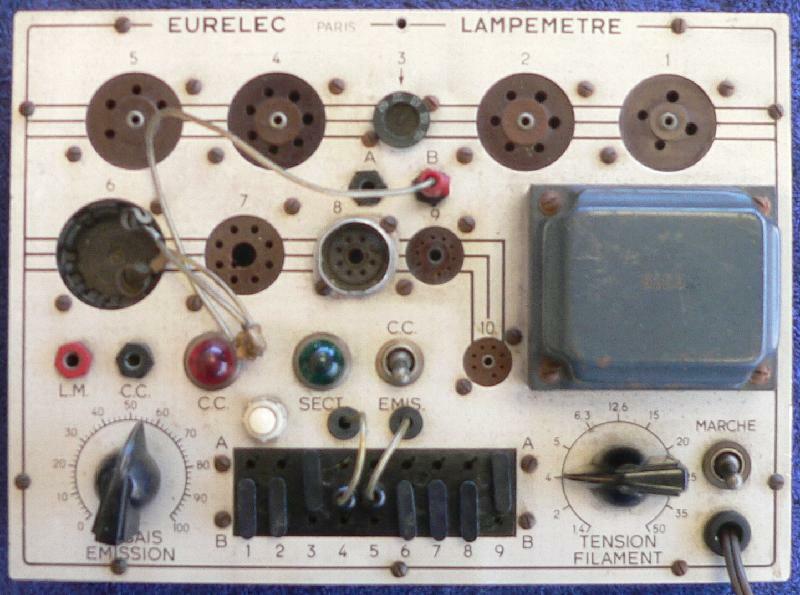 These units were built by the students at the radio school (I inherited this one from a French fellow my grandmother knew, along with a signal generator I will undoubtedly find again some day). It's used with a multimeter they undoubtedly also built. The multimeter has "LM" and "CC" terminals which are connected to the "LM" and "CC" terminals on the Eurelec tube tester ("LM" = Lampemètre, the German version terminal is marked "RP" = Röhrenprüfgerät). This multimeter has an FSD of 1mA and a series resistance of 72 ohm (in this mode). The multimeter scale is marked "BAD" to about 40% of FSD and "GOOD" from 56% up. The multimeter is bypassed by the "Emission" potentiometer, so that the multimeter measures a percentage of the current according to the potentimeter setting. You have to look up the settings in tables in the user manual. This gives you the potentiometer setting and the connections for any specific vacuum tube. "A" is the high-voltage supply and "B" is 0V. You can turn the pot to 100%, use a standard multimeter and scale the display to give you the current through the tube. Or you can build a meter just for this purpose, schematics on the two websites above. 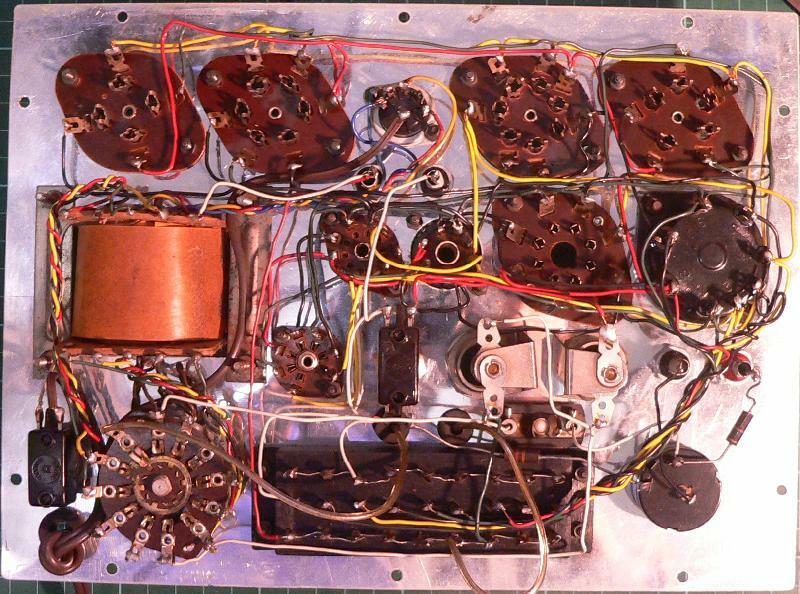 You can also check to see whether there are shorts between the anode and grid(s) and the cathode. Switching to "CC" ("Court-Circuit" i.e. short circuit) mode connects 6.3V to the "A" rail with the red lamp in series. A short between "A" and "B" will light the lamp.